Put raisins or fruits in a glass bottle. Add water until fruits are soaked. Crush or cut fruits. Add sugar or honey if fruits are not sweet enough. Check bubbles of gas coming to the surface. Starter-liquid is completed in 1 to 7 days in some environments. Mix starter-liquid and flour. Put it in room temperature.After 6-12 h, the mixture should have gone bubbly and doubled up. Add water, flour, salt to step3's product, and knead the dough well. Put it in a bowl or plastic container with lid and let tripled all night long (12-15hr, or more, at 15 degrees C (59 degrees F), 5-8hr at 20-25 degrees C(68-77 degrees F)). Shape the loaf, wait about 2hours for secound rise, and bake it. 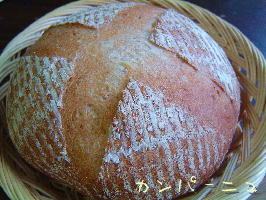 Feeding sourdough by flour and water is popular, but it needs frequent care and feeding.